Named in honor of the late Maestro Kenneth Schermerhorn, who led the GRAMMY Award-winning Nashville Symphony for 22 years, the Schermerhorn Symphony Center is home of the Nashville Symphony. Located in downtown Nashville's SoBro neighborhood, across from the Country Music Hall of Fame and Museum, the building hosts a wide range of musical events, including classical, pops, jazz, and world music. An experience at the Nashville Schermerhorn Symphony Center can take you on a musical Journey that will last a lifetime. Thursday, September 27, 2018 at 7 p.m.
Friday, September 28, 2018 at 8 p.m.
Saturday, September 29, 2018 at 8 p.m.
Visit the Itinerary section below for more details on events. 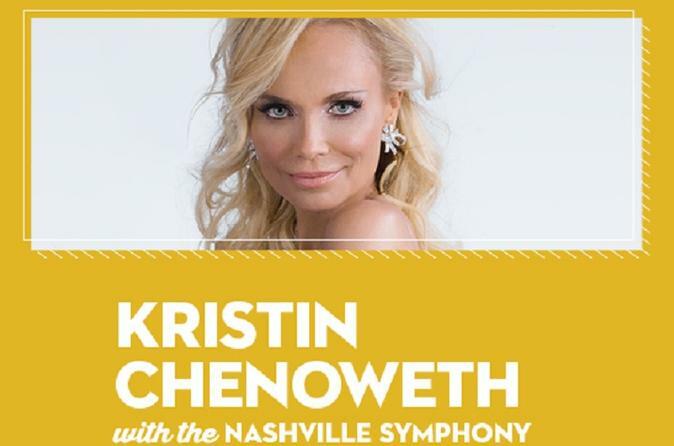 The Nashville Schermerhorn Symphony Center is one of Tennessee’s largest and longest-running nonprofit performing arts organizations and an integral part of the Music City sound since 1946. Join in for a season of incredible music. Choose between Main Floor and Balcony seating this event. The Tony Award-winning sensation returns for a night of Broadway and classic tunes. With her starring roles in Wicked, Glee, You’re a Good Man, Charlie Brown and more, Kristin Chenoweth has dazzled audiences with her powerhouse vocals and delightful stage presence. Be there for a night of show-stopping selections and gorgeous orchestral arrangements. Schermerhorn Symphony Center is located at the corner of 4th Ave. S. and Demonbreun St. in the heart of downtown Nashville, directly across from the Downtown Hilton and on the opposite corner from the Country Music Hall of Fame and Museum.